Do you find that you’re consuming too much mobile data from browsing on a web browser? One of the reasons this happens is that more and more websites use heavy scripts to display elaborate graphics, images, and videos, all of which require a lot of data to load. If you are on a limited data plan, then follow these tips and tricks to save some of that data consumption. 1. Android user agent – When you switch over to a mobile data network, remember to have the user agent set to Android mode in Dolphin settings. Since most mobile sites use compressed elements, this will use up less mobile data when processing the data transmission. At the same time, you can choose to load some websites in a simpler mobile form vs. the full version. 3. Download the content for later viewing – If you’re on Wifi, but are planning to head out soon, you can always save articles for offline reading. You can simply save the page as a .htm file or take a screenshot. Alternately, you can get the full article by using the Web to PDF Add-on in Dolphin Browser. This lets you save an entire webpage as a PDF file for you to view later without using up precious data. 4. Disable ads – Some websites use hidden scripts to track each your browsing behavior and then push ads to target you. These display ads often have moving elements or videos, which can also consume data. One way to remedy this is by using the AdBlock Add-on, which can be turned on or off via the right side bar in Dolphin Browser. 5. Disable auto-sync – Dolphin Browser has a Dolphin Connect feature, which lets you sync your bookmarks after you log in. If you are concerned about saving some data, you can sign out or disable Dolphin Connect so that your phone does not auto-sync. Hopefully these tips and tricks will help you conserve data when you browse on the go. 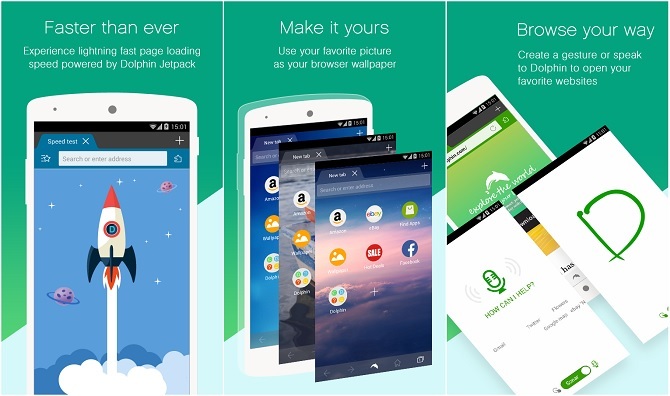 Download Dolphin Browser for Android today and start saving data!